"FedEx announced it is ratcheting up its commitment to augmenting employees with mechatronics. The cargo hub is a shining example of the synthesis of humans and machines. ...the shipper is using Vecna’s autonomous “tuggers” or rovers to move odd-shaped cargo through its North Carolina distribution center. Galen Steele, FedEx senior manager at the North Carolina facility, remarked, “I understand people thinking this will take their jobs. The Platform will deploy advanced robotics in unpredictable, ever-changing environments "to enable critical decision-making capabilities, intelligent motion, collision avoidance and reliable sensing." "With bright yellow paint, high ceilings and robots zipping across sprawling floors, Amazon's newest distribution center in Salt Lake City evokes a tech Wonka factory. From there, [an] elaborate distribution maze, ending with spiral slides that drop packages into the hands of workers to place on trucks..."
Why have so many people shown up in the last 262 years? "March 18, 2018; KERNERSVILLE, N.C. — As soon as the first robot arrived at a FedEx shipping hub in the heart of North Carolina tobacco country early last year, talk of pink slips was in the air. Workers had been driving the “tuggers” that navigated large and irregular items across the vast concrete floor of the 630,000-square-foot freight depot since it opened in 2011. 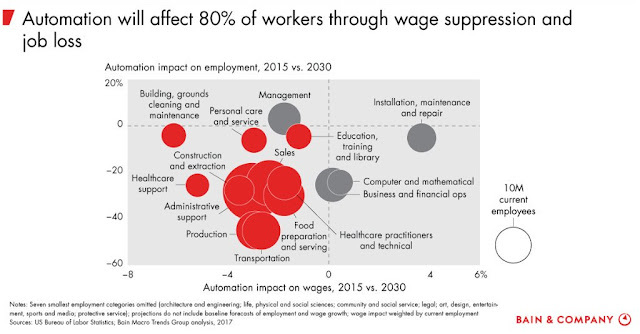 In a recent report, the McKinsey Global Institute, a business research organization, predicted that about one-third of workers in the United States will have to switch occupations because of technology-driven automation by 2030. “What people underestimate is the time needed for this to happen,” said Michael Chui, a partner with McKinsey. ...more than 80 percent of packages move across the facility through a system of conveyor belts, scanners and sorters that needs no human labor. ...When a truck filled with packages arrives, workers load the bulky items onto trailers hitched to a robot. Once these trailers are full, they press a button that sends the vehicle on its way. ...On the second floor of the North Carolina hub, where most packages race down conveyor belts, the company is preparing to install a system that can automatically recognize packages that need special handling. In the past, that also required a paid worker." "Conveyor belts, scanners, and even autonomous rovers are ultimately built to maximize employee output, but humanoids are expressly created to replace humans. The government of Japan envisions an even more robotic future of replacing its dying citizens with machines, particularly humanoids, to maintain its current standard of living and care for its geriatric citizens. on ever increasing supplies of what appears to be finite resources? But both are the refuge of political and economic opportunists. and seek to remedy the predicament? whose numbers double every forty years. as we consumed more than replenished. all of which end in a severely weakened position. Do fewer Gazelles = fewer Cheetahs? should more Gazelles and water lead to more Cheetahs? and eventually eats the cheese and itself until there isn't any mold or cheese left. and how and where who is most likely to survive. 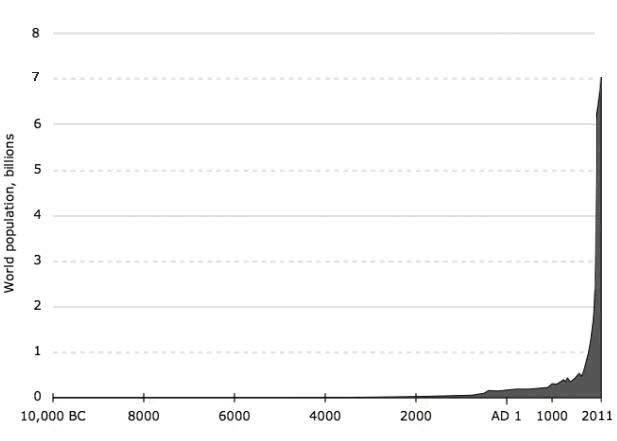 the human population of Earth appears to have done the same. that they really don't want it. don't do what you don’t want done to you unless you need to. that more or less compels you to go on destroying the world in order to live. and are offered $200,000 for the case? Have the educated underemployed caused most rebellions? are processes which all but wreck the societies in which they occur. …during the lifetime of man. and is still being enacted by them today, as successfully as ever. and is apparently about to end in catastrophe. to make the benefits of civilization available to the whole human race. Once off the cliff, there is still hope if you keep running. By running ever faster you may not fall. 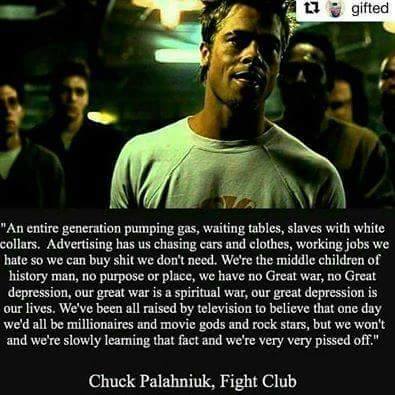 one tenth of one percent, should we take better care of what we have? but the opposite of one profound truth may very well be another profound truth. how fast are we surfing through the cosmos? while everyone on Earth would have aged about 7,000 years. and our parents gave us. Subsistence only increases in an arithmetical ratio. is to fill the world with fools. whose populations have been pacified with artificial stability and unsustainable subsidies. "Normal" jobs with benefits are increasingly harder to acquire. "Japan's sustainable society in the Edo period (1603-1867)"
do we probably not know much more than we think we know? by something even more bizarre and inexplicable. would he/she/it be very happy with what we’ve done with the place? a lot of people will be disappointed to discover they are not it. what are the chances of modern humans lasting how long? Nothing in the entire universe ever perishes…but things vary, and adopt a new form. yet the sums of things remains unchanged. do the atoms become part of everything else? on its way to becoming you. is everything on Earth relatively interconnected? did every living thing basically come from the same beginning? is that none of it has tried to contact us. what is the purpose of cognitive existence? as long as it doesn’t infringe on anyone else doing the same? say you can if you cant, obfuscate or say you’re going to do and don’t. is how he treats someone who can do him absolutely no good. leave others better off for having known you and the world a better place than you found it. return what you borrow, replace what you break and forgive quickly. Agreements to temporarily save jobs won't stop the robots. Technology is responsible for most job loss, and will only get worse. Technology is biggest threat to job loss-Trump Denies it to Fear Monger his base. 87% of manufacturing job loss in the US over the last two decades has been due to automation, not trade. Some industries see jobs move due to trade, but it's better to help those people than sacrifice everything else in the hope of saving jobs that robots will do soon anyway.